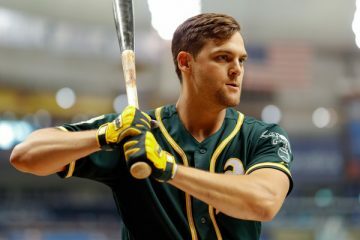 THE DYNASTY GURU’S TRIPLE PLAY: Oakland Athletics! Welcome to The Dynasty Guru’s Triple Play! This is a brand-new series where three very cool dynasty baseball nerds- Adam Lawler, Patrick Magnus, and Keaton O. DeRocher- bring to you a succinct analysis of a pitcher, a hitter and a prospect from each organization. We’ll be running this regularly until we cover all 30 teams! Each team will be covered in alphabetical order. This article we’re covering the Oakland Athletics. And, while we here at The Dynasty Guru are primarily baseball obsessed, we’ll also be touching on some music we’ve enjoyed from each team’s home state. Enjoy, and leave us your question and comments below! Infatuation: an intense but short-lived passion or admiration for someone or something. When I was younger, my sister told me time and time again “You need to recognize the difference between infatuation and love.” You see, I had fallen very hard for a beautiful woman. Early on things moved fast, and I thought I was completely in love. However things became turbulent early on, and something I thought was amazing was not. The two of us together were toxic, and after far too much pain and frustration, the relationship ended. A terribly hungover first date, one week-long trip to the west coast, and several months of Skype dating later, I arrived in China and moved in with this woman. Six months later I asked her to marry me, and now two and half years later we are expecting our daughter in June. Why am I sharing this personal story on a dynasty baseball website? If you’ve listened to The Dynasty Guru Podcast, then you know I have had “a bit of a thing” with Matt Olson [Ed. Note- that’s putting it lightly]. Last year Mr.Olson came out and destroyed all the baseballs. In a mere 59 games, the rookie first baseman smashed 24 home runs. He committed baseball mass murder. This resulted in a rather strong emotional reaction from this would-be fantasy baseball writer. Had my previous experiences in romance taught me anything; was this to be the dynasty first basemen of my dreams? Or was I about to let infatuation bring me into a toxic relationship that would end in disappointment and regret? That’s a hell of a year. A combined 47 homers between the majors and the minors, and while I knew that Olson was unlikely to be a perennial 50 home run bat, somewhere between 30 and 40 seemed reasonable. Once I started looking into the Statcast data at Baseball Savant, there was no changing my mind about how I should feel. I wanted Matt Olson to be love at first sight. A Big Bat capable of glorious home runs, a keen eye that has great at-bats, and a big slow player who plays a position with little risk for injury. That is the key to my heart. Matt Olson looked like the most beautiful woman on the dance floor. There are two immediate active players the come to mind when I think of the above description: Miguel Sano and Joey Gallo. I decided to dig into some of their Statcast statistics to see if I could find any supportive evidence that Olson was on a similar track. The more advanced metrics seem to indicate that Olson is closer in line to 2017 Sano than 2017 Joey Gallo. These stats also confirm that Joey Gallo is very strong. Last year’s more traditional statistics seem to indicate Olson is more Sano than Gallo as well. All three of these players also carry well-above-average strikeout rates. Both Gallo and Sano posted K-rates around 36% while Olson whiffed 27.8% of the time. That’s probably one of the various reasons Olson posted a much higher xwOBA than either Sano or Gallo. None of these players are going to win batting titles, and the solution to the shift for these players is to hit them out of the park. What Are We, Matt Olson? WHAT IS THIS? While it hasn’t quite been long enough to determine if what I’ve felt for Olson is love or infatuation, the 2018 season is underway and its time to start examining my relationship with Olson. I need to see if he’s the dynasty first baseman I’ve dreamed of or if he’s another heart-wrenching mistake. Most Matt Olson owners are happy right now. He hasn’t lit the world on fire by any means, but he’s hitting .272/.344/.407 with three home runs, and even one steal. Once we start to look at the entire approach, however, things start getting less clear. Tons of red flags here. First, where is all the power!? Why is Matt Olson not destroying ALL THE BASEBALLS?! Next, that strikeout rate is Gallo-ian. If you’re not hitting a ton of light-tower bombs to go with it, then you aren’t allowed to strike out at an almost 40% clip. He’s hitting for average though, so no big deal? However, a .432 BABIP seems to indicate that he’s had a bit of luck on his balls in play. Welp, looks like I’m doomed to make the same dynasty baseball mistakes of the heart. Although… there are some positive indicators too. The launch angle isn’t quite the same, but he’s still above league average, and he’s actually hitting the ball harder than he did last year. He’s hitting fewer fly balls and more ground balls. But he’s also hitting more line drives, which is a bit strange considering he’s supposed to be a dead-red power-pull hitter. I’ve been watching a lot of Matt Olson at-bats, and I’ve noticed some things. The dude looks completely lost at the plate at times. He’s still having long at-bats, and he’s looking to drive the ball more to the opposite field. Indeed, his oppo% is up by 6% and his cent% is up almost 10%. He’s still having good at-bats, as he’s seeing 4.32 pitches-per-plate appearance (slightly higher than last year). As for looking lost at the plate, really we only need to look at his 37.8 K%, and 17% swinging strike rate to know it’s true. Baby, Don’t Hurt Me. No More. Unfortunately, it’s still too early to tell if this is love or an infatuation. Olson has some positive signs, and while the power hasn’t fully arrived yet, I still expect it to. If you’re not an Olson owner there’s most likely a buying opportunity coming, because despite his new approach that average is going to crash. He cannot continue to strikeout as much he currently is, and I think that as he continues to tinker with his approach there will hopefully be a correction. Olson needs to bump his BB% to 10 and cut his strikeout rate to at least mid-to-high 20’s in order to be useful in dynasty. If he’s able to do this I expect a line similar to Miguel Sano’s 2017, and that might set up a big 2019. In most formats, I am buying or holding Olson. My feelings for this dynasty first baseman are strong, and while his 2017 is slowly slipping into the rearview, I’m not quitting him yet. Maybe our relationship will end up flaming out. A mistake to learn from as I search for the dynasty first baseman who looks like he’s straight out of Mad Men. What started so quickly and filled with passion may end as a player evaluation love lesson, or maybe… maybe Matt Olson and I have a baby. Don’t give up on Love, Don’t give up on Olson. It’s unfortunate we’re going in alphabetical order with this series. I had Manaea pegged as a breakout candidate coming into the season, which is why I wanted to do my Oakland write up on him. Then, a day before this write up is due, he threw a no-hitter. I had a whole thing planned to break down his pitch usage and how he’s developed an above-average changeup that’s generating more whiffs season-over-season to pair with his devastating slider. Then he threw a no-hitter. I was going to implore you to go gather up as many possible shares of Manaea as you could. Then he threw a no-hitter. So now a small change of plans, instead of a pitch to go out and snag Manaea, we pivot to an ode to his no-hitter and one of the best sliders in all of baseball. Manea really does have one of the better sliders in the game but doesn’t get a lot of recognition for it. Here are two examples from his no-hitter: he had pinpoint accuracy with it and neither righties or lefties could do a thing about it. Now for the Changeup that was mentioned in the intro paragraph. It too, is rather filthy and poor JBJ couldn’t do a darn thing against Manaea. It has some nasty movement and there’s not much really any batter can do with that. 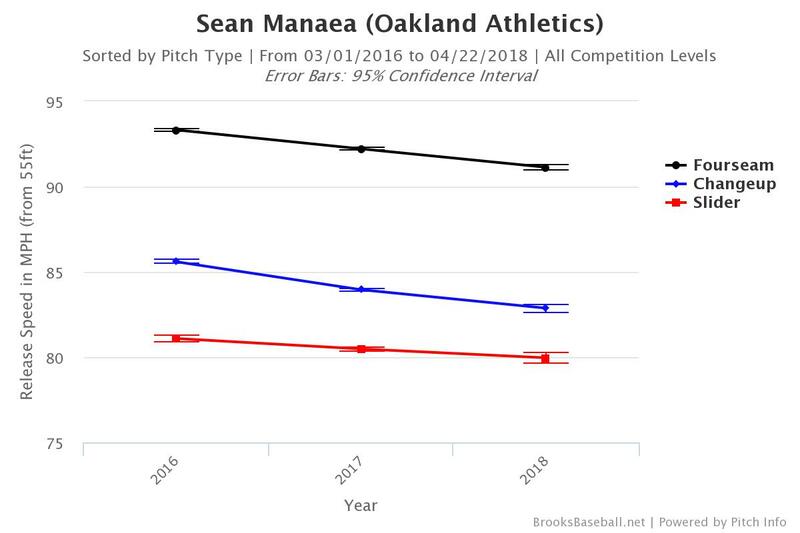 As noted above, Manaea has continued to get better with it, seeing an increase in whiff rate on his changeup over the last three seasons. 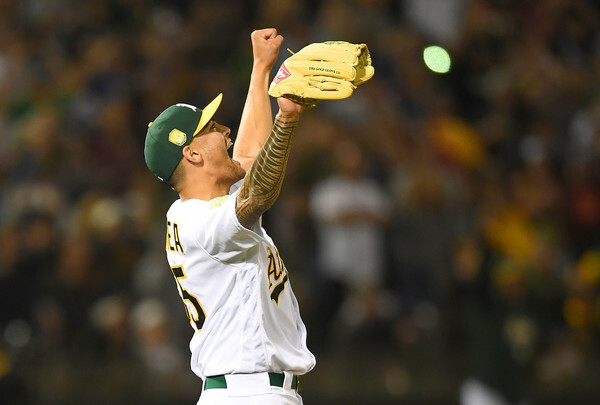 With two above average pitches and above average command of all his offerings, Manaea has gotten himself off to an incredible start ot the season even before the no-hitter. Manaea has worked 36.2 innings to the tune of a 1.32 ERA, 0.60 WHIP, with 30 strikeouts and only 6 walks so far. 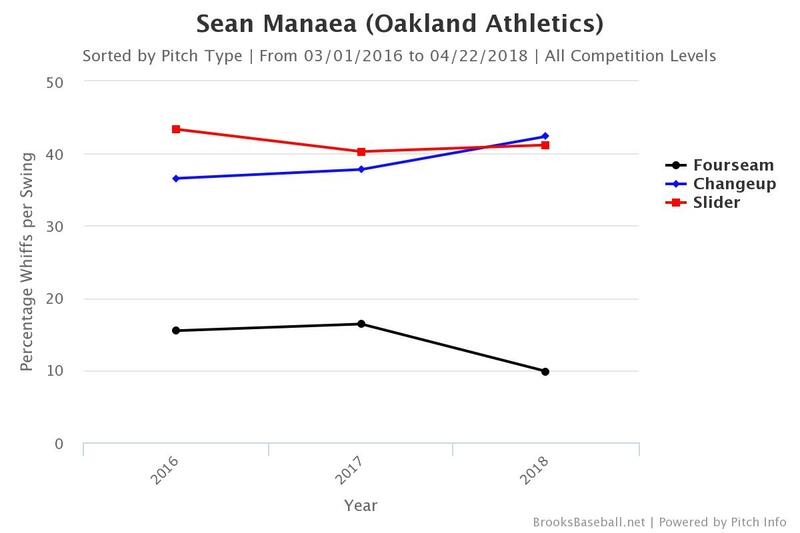 One thing to monitor as Manaea progresses is his velocity. Each of the last three seasons Manaea has actually seen his velocity decline across the board on all of his pitches. He’s made up for it with his control and limiting walks. However, a 26-year-old with declining velocity is certainly curious. The results don’t lie though, and Manaea has been lights-out to start the 2018 campaign. This is what leads me to believe he can be a very successful pitcher in the mold of Zack Greinke in that he isn’t blowing guys away with pure heat but rather out-dueling them with his pitch selection and command. If you didn’t jump on Manaea in the offseason the time has passed, but that doesn’t mean you can’t sit back and enjoy what he’s been doing on the mound. If Manaea is your guy then by all means #GetYourGuy but the price isn’t going to get much lower so prepare to pay for it. You guys, I think Jesus Luzardo is going to pretty darn good. Like “vying for best prospect pitcher in baseball” good. Like, if you have him and Sixto Sanchez in your farm system by the end of the 2018 season, it would be like having Alex Reyes and Forrest Whitley in your system at the end of the 2017 season. He’s going to be special…if he stays healthy. Luzardo is a high school draftee from Majory Stoneman Douglas. Yes, that Majory Stoneman Douglas, and Luzardo has some very powerful thoughts on the matter if you would like to hear them (and the same Majory Stoneman Douglas that has students you can support here as they search for something positive out of tragedy). Luzardo’s repertoire is a standard three-pitch mix (FB, CB, CH). The off-speed stuff grades out as a plus, but I think the curve has been slightly underrated and sometimes has been viewed as more of a slider. This is interesting to note because those tweeners are the types of pitches that get the most movement in the zone and cause batters to look silly. I think Mike Trout probably feels the same way. As you can glean, Luzardo has come out like gangbusters. Shredding the competition to the tune of 15.34 K/9, a 9.1 BB%, a HR/9 of 0 and a 2.8 xFIP (Yeah, I used xFIP. Don’t @ me.) over the course of 14.2 IP. Undoubtedly, he’ll be in Double-A sometime this summer while knocking at the door of Triple-A beginning next year. Sure. Handwave and cite SMALL SAMPLE SIZE and exercise caution. Explain that he’s never pitched over 50 innings of professional ball. Be reasonable. That’s fair. But you’re missing the point (and the boat) too. In order to get on the ground floor of someone special, you need to get in early. My hope is that as the A’s increases his innings, he struggles or tires over the course of a few starts. Skittish owners will be happy to use the usual dynasty talking points to rationalize moving a truly special arm for a safer commodity like a bat or a close to MLB ready arm. However, if Luzardo keeps this up, he’s going to zip through the system and I’m going to need to pay full freight. Get in while you can. Seasick Steve is the GOAT. If you aren’t down with a dude that can shred the guitar the way Luzardo has shredded A ball while looking the way I imagine Charlie Blackmon will look in 30 years… you don’t care about baseball or music. Seriously, this guy is crazy interesting. Listen to the first 25 seconds of this video as he chats with the videographer and tell me you wouldn’t want to buy him a beer as he spins a yarn. Follow us on Twitter for baseball, jokes, Keaton’s trolling, and other very cool opinions! Tons of posts, debates, and many replies from writers here at TDG! If you love what we do here and want to help us keep making it, or if you want downloadable access to a whole ton of content, you can donate a minimum of $5 to receive exclusive downloadable access to the entirety of our ultra-deep dynasty rankings. That includes Bret Sayre’s Top 500 for standard leagues, Tom Trudeau’s Top 500 for OBP leagues, Jesse Roche’s Top 200 prospects, and our entire rankings series in downloadable form. For more information click here. Should You Panic About Sonny Gray?